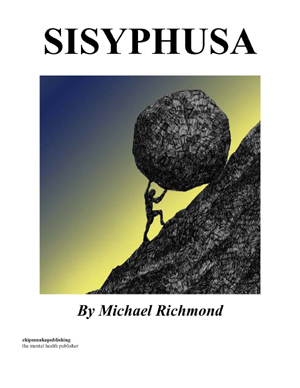 Sisyphusa is an allegory of depression and the mental health system as seen through the eyes of its main character and first person narrator, Odis Winston. Odis is abducted from a comfortable existence at university and taken to an institution called 'Sisyphusa'. He is told when he arrives that he is 'Weird' and that he cannot leave until he has been 'Normalised'. He has been fitted with an Earpiece which has a poisonous and malign voice, similar to his own, and which begins to torment his every waking moment. Encountering characters and situations loosely based on Homer's Odyssey and in a dystopian style influenced by Orwell and Kafka, we follow Odis's transformation from helpless captive to active rebel and leader. The book is imbued with dark humour and compassion for its characters and their struggles. It manages to be a satirical polemic of our own times while creating an entirely new world of "Aspirati", "Hysteria-Dominated Television (HDTV)", "I-Spy's", and "Climbing Pills." It explores Mental Health themes surrounding institutionalisation, dehumanisation, self-harm, stigma, suicide and media (mis)representation. Michael was born in London in 1986. He had a happy childhood, growing up in a loving home with his parents and older brother. He always liked school but was equally occupied with enjoying life with his friends and family and continuing his lifelong romance with Arsenal Football Club. After A-Levels, Michael travelled around India, Southeast Asia and Australasia for 6 months before attending the University of Sussex. He felt in his element being at university and living in Brighton. He was growing, working hard and making wonderful friendships. However, halfway through his second year of university, in February 2007, he had a very sudden and unexpected onset of what was later diagnosed as Anxiety and Clinical Depression and later still with a form of OCD. Within the space of a week he went from being a very confident and successful student to being unable to leave the house that he was living in with friends in Brighton. Michael had to move back home to hisparents’ house in London where he has remained ever since. He has had various talking therapies and medications over the four years he has been unwell, some of which have been very helpful, others distinctly unhelpful. He began to read avidly after the first year of almost catatonic depression. He has also tried to learn Spanish and Portuguese and has taken up the piano. He wrote Sisyphusa over the course of around eighteen months initially inspired by a strange dream and by the anger he felt after attending a psychiatric day hospital for six months. Michael has felt a stark rupture in the way in which he has experienced life before and after his breakdown. He is no longer as housebound as he was in the first couple of years, thanks in large part to his Cocker Spaniel puppy Milo who demands constant walks and attention. He has fewer crises, and with the help of his family and caregivers he has learned more effective ways of managing his symptoms. Nevertheless, his situation remains very limited as hefeels unable to work or to resume his formal studies, nor does he feel able to be in contact with former friends from school and university or most of his wider family.But he’s pleased to be able to share his work with a wider audience and to add his voice to the many thousands fighting against the stigma surrounding mental illness. They came in black cloaks, the men from Sisyphusa. Not the white coats you hear of in stories growing up on Fantasy Island. I was living in a rented house on the south coast of the Island. The two-storey red-brick building stood on top of a steep hill on the outskirts of town. There were seven bedrooms, two grimy, unkempt bathrooms and a kitchen that stank of Liquid Escape and stubbed-out cigarettes. We had no living room—our budget could not stretch to such luxuries. We made do with some carefully arranged floor cushions and a second-hand bean-bag placed at the far end of the kitchen. I was living with six other students from South Coast University. We had all met and become friends in the first year and it seemed a natural evolution that we would move off campus together in year 2. They came for me on a dreary night in February. I was planning a night out at the local Liquidiser to celebrate Loveheart Day with my housemates. On this day lovers young and old must buy their sweethearts all manner of gifts and treats to parade their affection. This left them safe in the knowledge that they weren’t obliged to be romantic again until the same time next year. We of number 67 Cossetts Lane decided to enjoy the evening as a group, being mostly sheepish singletons. Loveheart Day was one more chance to imbibe a few gallons of Liquid Escape and lose money on the Electronic Quiz Machine (EQM). The rest of the clan had gone on ahead. I’d only just woken up after an all-nighter and Wellborn was applying the finishing touches to his hair so we agreed to meet them there. I decided it would be prudent to have a nice hardy dinner before another night of revelry. “In a rush? Ya has ta have a Fasta-Pasta” as the Ad-Verse goes. I slopped the contents of the packet into the Zapper and gave it 30 seconds- time enough to rummage around under the bed for my jacket. It was a silver and black number that set me back 120 coins. I put it on and looked at myself in the mirror, standing in profile. Staring back was a tall, slimmish 20 year-old with short brown hair. My face was protected by patchy brown and red stubble which I had cherished and cultivated ever since it sprouted on my babyish 18-year-old face. Mildly satisfied with my profile I took a closer look. My eyes were blood-shot and glazed from lack of sleep. I stretched the bags under my eyes down over my cheek-bones but was distracted by a huge pimple just below the scar on my forehead. And who on my side? A couple of minutes later I’d had as much of the bowl as I was going to have and flung the rest into the waste bin. The clock on the HDTV read 8:48pm. Drinks time. I shouted up to Wellborn, “Are you done yet?” The diminutive young man couldn’t hear me above his stereo. I vaulted up the stairs, three at a time, almost tripping up on the top step. I knocked on the door. He opened up and beamed a smile in my direction. “Hey Maestro,” he said. “So, are we getting Liquidated or are you gonna do your hair all night, princess?” “It’s all about looking dapper, my man,” he grinned. “Even in a Liquidiser frequented by old men with no teeth and no women?” We both laughed as we strolled around the corner to “The Liquidiser on the Hill” talking about nothing in particular.